Are you confused by all the speculation out there about the End Times? Are you frustrated with how often the predictions fail? Has the Left Behind interpretation left you unsatisfied? Do you want to know what Jesus really said about the End of the Age? Then this controversial hard-hitting audiobook of shocking revelations is for you! What Does the Bible Really Say about the End Times? There are so many Christians teaching outrageous speculation about End Times Bible prophecy these days. It’s enough to frustrate the serious Bible student. What if you found out most of it is simply mistaken? What if you found out that everything that modern prophecy pundits are looking for - the Rapture, the Tribulation, the Antichrist, The Beast - was not what they told you it was, but something different? 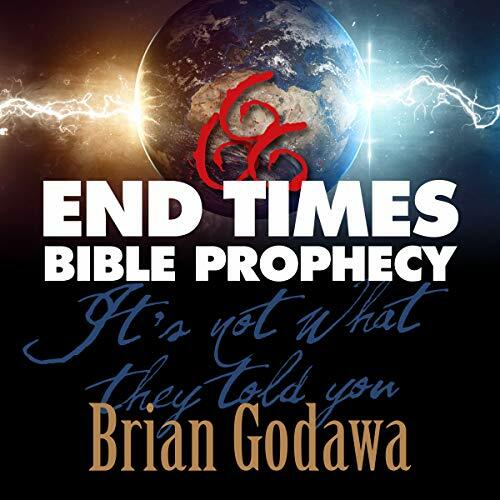 You’ll hear Godawa’s own personal journey in changing his understanding of the End Times. You’ll find out how hyperliteralism corrupts Bible Prophecy interpretation. Godawa focuses on Jesus’ own predictions about the End of the Age in Matthew 24. You’ll discover the dirty little secret behind the so-called Rapture. The truth about the Last Days. It’s not what they told you. Just what is the Great Tribulation and when did it happen? What the heck are those cosmic catastrophes in the heavens? You’ll be amazed when you see how the coming of Christ on the clouds has been completely misunderstood by well-meaning but misinformed prophecy pundits. This is not newspaper exegesis, but intense Bible study. This audiobook is guaranteed to inspire your love for God’s Word and His promises to His people. The author and I share a similar journey due to our similar ages. Back in the 70s, The Late Great Planet Earth along with Jack Van Impe scared the bejebees out of me, as a boy, with their confidently sounding conjecture and speculation. And, I remember the "Countdown" in the 1980s. All I can say is, if you are tired of the incessant, futile, non-sense of persons trying to fit modern headlines into sacred text while ignoring history, context, and the original audience, then you have come to the right place in Brian's "End Times...." The benefit of reading Brian's in-depth discussion on the Preterist view: It is like someone giving you your bible back and allowing you to actually *understand* what Jesus was saying, *who* he was saying it to, and what transpired shortly thereafter. Matthew 24 was Jesus confronting the unbelief head on and with dire warnings of consequential disaster. You'll see Jesus as a politically incorrect Warrior, as well as, The Lamb. Words like "generation," "you", "quickly", "at-hand" will become perfectly clear and lose their nebulous, transcendiary shroud of mystique and confusion. If you are able to put aside any bias and preconceptions of the Last Days, then I think you will find the book thought-provoking and, perhaps, it may even change your mind about some things. OT and Olivet reveal the past - not the future. The Old Testament is a history. It doesn't have a future fulfillment The account of Jesus in the Olivet Discourse was to predict the destruction of the temple after his death and resurrection, a few years later. With such an expansive title: End Times Bible Prophecy, it should have dealt with Revelation too. Is any of it history? If it is, how much is in the future? Both of them are important questions! That wasn't covered in this fairly lengthy book. This is a great book. Lots of wonderful information. Well thought out, and presented with sources. Well worth reading. The truth will set you free. A great book I will not read again. I suspect you may be right, simply because I have yet to go back and check every dot and tittle myself. But removing the "wrong idea" without leaving even a semblance of the right idea, was not very helpful to me. Admittedly, early Christians struggled a lot and had much tribulations, but the count of souls living today serving God and expecting his prophesies to have something to teach us also about our life, in a time when there are more Christians alive than all who came before the present era, leaves more vacuum than trust or purpose or expectation. Of course, history will run with or without our approval. I hope Brian is right: No great tribulation ahead? No Antichrist? Just “Peace and security”, perhaps destruction will not come upon us like labor pains on a pregnant woman. When I heard references to the Apocrypha, not part of the Bible as if it is, and other extra-biblical sources that did not harmonize with scripture I found it hard to give credibility to this work. The tone of the author was condescending to those who don't follow this worldview. That condescension was hypocritical to what the author himself projected through this message. I did find this body of work thought-provoking and there was some good truth to the interpretation of the Olivet discourse. Where does End Times Bible Prophecy rank among all the audiobooks you’ve listened to so far? I would rate it in my list of best of the best! Eye opening revelation about the real historical meaning of bible prophecy, especially in the New Testament. Yes I could hardly quit listening and got back to it as soon as I could! For anyone seriously interested in end times bible prophecy this book is must! If you could sum up End Times Bible Prophecy in three words, what would they be? Partial-Preterist view of the 'End-Times'. The many references to some events spoken of in Revelation and Matthew 24 etc as to be coming soon or in that generation make a lot more sense if they are referring to the destruction of the Temple and the New Covenant replacing the Old. A lot hinges on the dating of Revelation, which would have to be before the destruction of the Temple in A.D. 70. Great book, well worth getting for an easy to understand, alternative look at a sometimes confusing topic. I listened to it in a day and will no doubt listen to it again in the future.